Yesterday we began ascending the lateral moraine of a glacier that begins just above our lodge. 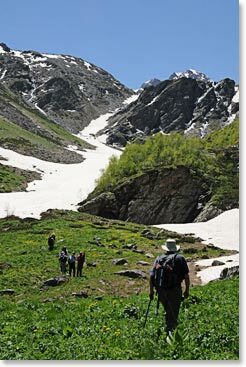 The trail was beautiful with wildflowers, lush meadows and cold, rushing glacial streams. We had to wade across one of the streams and when we got back onto the grass it was so soft and warm that we continued climbing without our shoes. We ascended a total of 2,700ft/825m, to an elevation of 9,700ft/2,955m. Along the way we encountered a family of “West Caucasian Tur” – a member of the goat antelope family found in the Caucasus Mountains. They are quite rare with only 5000-6000 animals left in the wild. We were back at the lodge by 7:00 PM and after we took showers we had a nice supper at 8:00 PM. 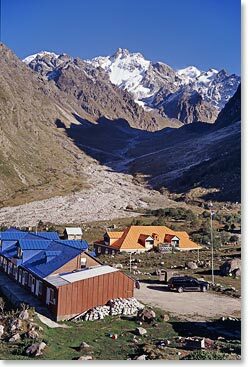 Today we will ascend even higher, to an elevation over 10,000 feet where we will sleep overnight in a small hut. Sleeping at this elevation should be a great aid for our acclimatization. A 3-D relief model map in our dining room shows the location of our lodge at the confluence of two mighty glacial rivers. The map shows the “refuge”, or small, mountain hut, where we will spend the night in a remote side valley high above. Left: Beautiful views from our comfortable lodge. Photo Credit Vladimir Kopylov.